Got a poking wire, a loose bracket, or other problem with your braces? 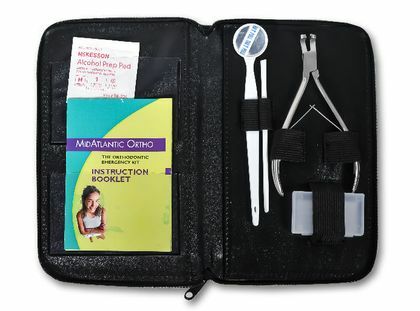 This Orthodontic Emergency Kit can keep you comfortable until you get over to your orthodontist. Keep it in your car, desk, or at home for a fast fix. The Kit zips around on three sides and opens flat like a book, and measures approx. 8" X 5". The case is made of water resistant vinyl. Using this Kit, you can cut a poking tie wire or arch wire, temporarily fix a loose bracket or band, or push your arch wire back into place. This Kit is intended for "emergency" maintenance on your braces. You should make an appointment to see your orthodontist or dentist afterwards. Take this Kit with you to your orthodontist or dentist for more thorough in-person instructions on how to use the items in your Kit. When cutting tie wires or arch wires, please be careful not to swallow any tiny pieces of wire. Use a tweezer and let someone help you, if possible. When in doubt, wait and let your orthodontist do it for you. Please note: This Kit is intended for adult use on metal or ceramic braces. It will not work for Invisalign or other clear plastic braces. The Kit zips around on three sides and opens flat like a book, and measures approx. 8" X 5". The case is made of water resistant vinyl. Please note: This Kit is intended for adult use on metal or ceramic braces. It will not work for Invisalign or other clear plastic braces. Use at your own risk. I wish I had a kit like this when I had braces! It's very common to get a poking wire just when you can't get to the orthodontist! The items in this kit will tide you over and help you feel comfortable until you can see your orthodontist. This is great, the cutters actually cut the wire on my daughter's braces. About every other month her braces wire slides to one side and pokes her in the gum line. It can become very swollen and irritated. I used to have to make an appointment each time to get this slight adjustment corrected. Now I can cut the excess wire until our next appointment and avoid missing extra work and school. No effort to trimming the extra wire in the back now. Good quality and sharp. Good ! See the instructions , they will guide you!